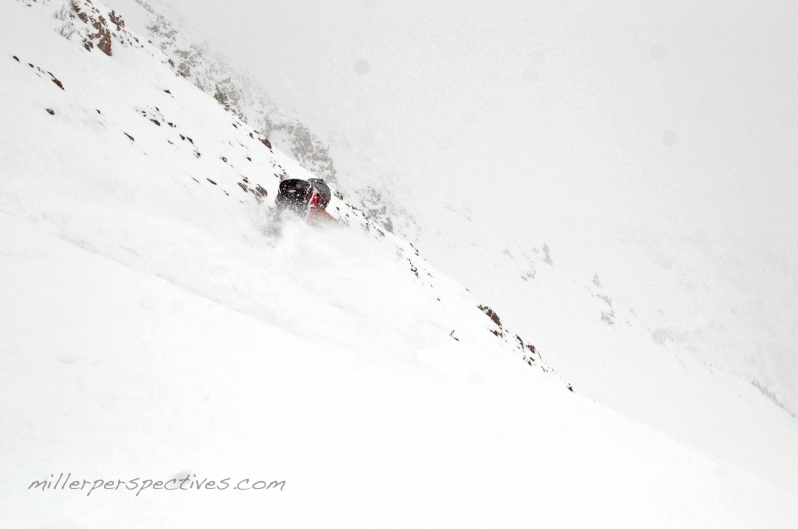 With great conditions and more snow, it was basically impossible not to go out again for day #3 of what has thus far been a stellar season. 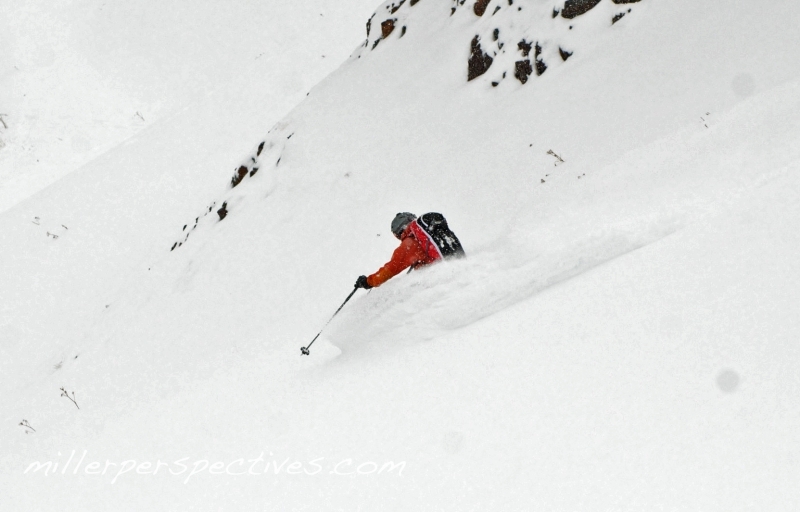 The weather forecast looked marginal, but sometimes you’ve just got to roll the dice and hope for the weather window. 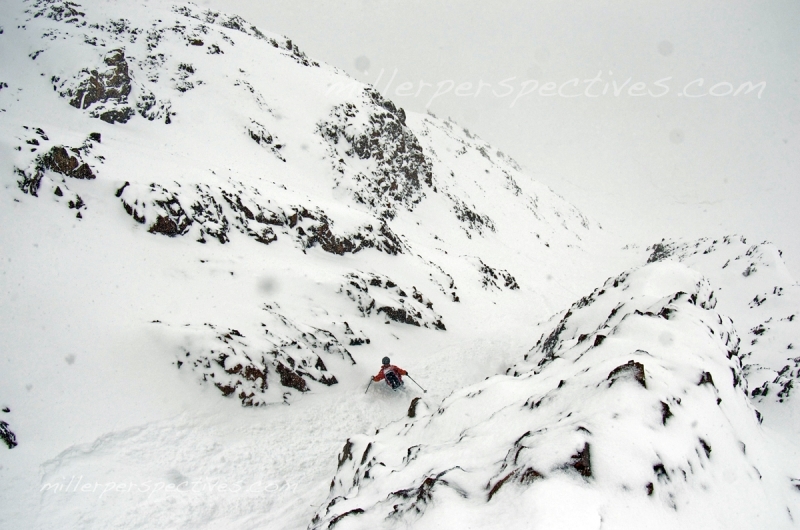 And if it never comes, all you can do is try to pick a place with some definition thanks to trees or a couloir. It was at about this point that I grabbed my camera, lined up the shot, and heard my camera beep at me. Dang it, the SD card is in the computer. Luckily, my partner for the day, Chris Miller, takes better photos than I do anyway and was willing to share. If you haven’t checked out his website, millerperspectives.com, you should. Thanks for the great photos and great day out, Chris. The sucker holes we enjoyed in the lower valley were just that- sucker holes. The higher we got, the deeper into the ping pong ball we found ourselves. 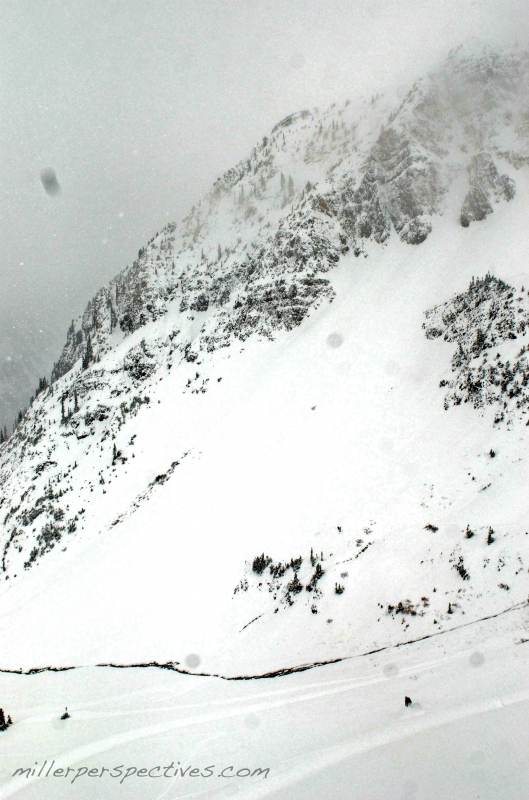 Looks like we’ll ski a couloir today. As long as we can get up it first. 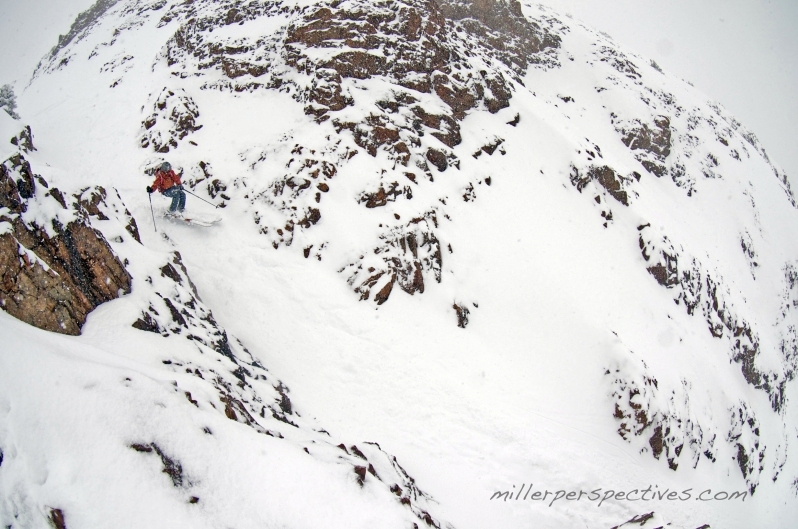 We did make it up and I got the honors of dropping into the milky abyss first. 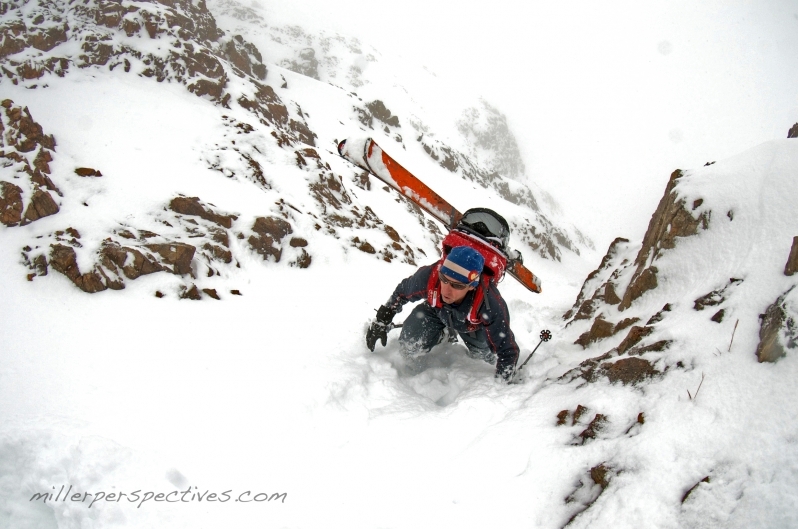 Down on the apron, we found unbelievably good snow for early October on a south face. Yes, I said south. South facing face shots, no less. The low-lying clouds made for some cool scenes, if not perfect light. All in all, the kind of day that reminded me of my time spent living in B.C. Looks awesome Frank, amazing to get that kind of skiing this early. Here’s to a great season to come! AMAZING! 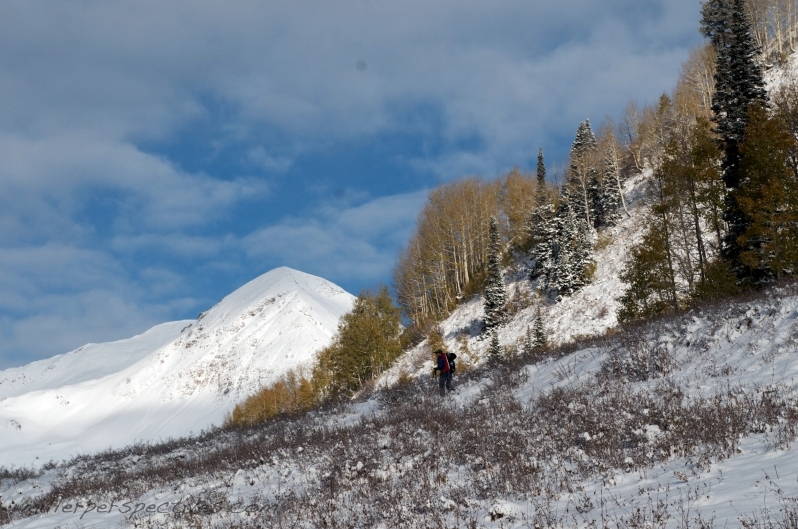 I cant believe you guys are getting skiing of this quality with leaves still on the aspens . . .
Let’s hope it keeps up, Ben!